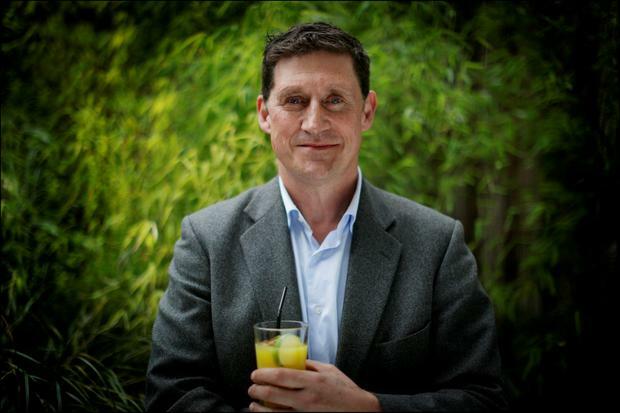 Green Party leader Eamon Ryan is the country's leading voice on climate change. A former Minister for Energy, he extols the virtues of electric cars and championed the Cycle-to-Work scheme. Fiercely critical of peat production - he campaigned for a change towards renewable resources - he transformed his own Clonskeagh house, while Minister for Energy, into an A-rated home. It can run entirely on a single wood stove. On the face of it, he is the essence of green living. Having lost his Dail seat in 2011, he is now in prime position for a job at the top table - keeping a watchful eye on our environmental practices. When we meet at his party headquarters on Suffolk Street, he outlines his dream for Ireland in our lifetime. "Zero fossil fuels [and] it will be a better and fairer economy because of that, because we'll own our own energy. It won't be imported from the Middle East [and] there will be a food system that is healthier and more satisfying for the farming community." As for driving: "It'll all be electric cars." He might find that bit to be quite a challenge. When we get down to the nitty-gritty on lifestyle, he holds his hands up. "This is why I don't concentrate on the individual. I have a 2.5 litre Volkswagen Caravelle." It was previously owned by former Green Party leader Trevor Sargent. "It runs on biodiesel but em… it's a big… it's a big van. We have it for the four kids"
Like most people's attitude towards doing their bit for the planet, he doesn't feel guilty about the gas-guzzler because- he has a young family to drive around and he is up and down the country with Green Party colleagues. It's a necessity: "And I suppose you kind of recognise that." He can rest easy with his green mindset because he believes it is more important to focus on the number one cause of global warming - fossil fuel - rather than the effect individual behaviour has on the world around us. "I think we need to slightly reconfigure how we do it. One of the things the environmental movement has got wrong in the last 20, 30, 40 years is that we place a lot of the attention on the individual. 'What are you doing? 'And you feel guilty for not doing the right thing." But, he says: "The source of the problem is fossil fuels. So rather than putting all the emphasis on the end of the pipeline [and what] the consumer is using - start at the source." Lucky for him then, because what is really weighing down his carbon footprint is his air miles. He flies every two to three weeks. All for business. Mainly for conferences on climate change. If it has a ring of the same hypocrisy of which fellow campaigner Leonardo DiCaprio has been accused, Eamon owns up to it. "I can justify it …. maybe I can't, I mean what I was doing, what I was flying to [for example was] the Paris climate talks. I was flying to meet the German government to talk about renewable [resources]. So I could say it's all justified because I am working on climate stuff here. But that's a kind of a slightly easy cop-out," he said. "But going back to what I was saying earlier about how we frame this question: We have got this huge challenge. We have got to break it down into its component parts. We have to first change our entire energy system, which is zero carbon, and that is very doable." He has asked himself: "In the interim do I make the decision that I'm not going to fly?... I guess I kind of made the equation in my head that 'well I am part of the system and I am trying to fix this'. If part of my work involves flying, well I just gotta accept that." He holds his hands up: "I am a top sinner .... sinner is the wrong word ... but I am not as white as the driven snow when it comes to my own carbon footprint." Still, he is making an effort in other areas. He recycles all rubbish, buys local produce and cycles to and from work to his office - a €40,000 a year rented space on Suffolk Street in the heart of Dublin's city centre. His interest in the environment started as a 16-year-old boy in Gonzaga College after a tough start at Holy Cross school in Dundrum, where he regularly got into fist fights. "I remember everyone around in a circle [shouting] 'Claim! Claim! Claim' and I remember thinking 'I gotta go in here and punch someone'." He describes it like a scene from Lord of the Flies. When he eventually moved to the private boys' school, he was more at home. There, the Jesuit teachers taught French existentialism and pupils were fed a diet of Albert Camus and Jean-Paul Sartre. He was reading economic bibles such as The Limits to Growth and Small Is Beautiful by the time he was a young teen. At 16, his class was loaded into a bus and brought to the Glen of the Downs for an ecology lesson. "I thought it was a joke. We went off and hid behind the trees and we were smoking [thinking] this is fantastic. We are free!" The boys returned to class with tape recorders full of their impersonations of squawking birds, emptying piles of weeds from their pockets onto the teacher's desk. But their mentor persevered and it led Eamon to discover a passion, although he wouldn't incorporate it into his career until later in life. First, it was to Commerce in UCD, where he says he became the typical "Ross O'Carroll-Kelly jock". "I mean, I had become the pure southside Dublin boy." Afterwards he went globe trotting for three years, working in a cafe, hanging out with a fun-loving crowd and - as he later made headlines for - smoking the odd roll-up of dope. It's something which he believes should be decriminalised in the next five years and used to help people with illnesses such as cancer. On returning home, he found himself unemployed for a year-and-a-half. His lowest point was when he went for an interview with Bord na Mona. "I was perfectly well qualified for it and half way through … I kind of, I didn't break down, but I froze and I was so upset because I needed the job and I needed to get out of a rut." Collecting his dole on Werburgh Street was "an amazingly grey place with mesh wires, barriers and desks… everyone looked grey". Around the same time he started working for the Green Party on a voluntary basis and went on to set up Cycling Safaris from his bedroom in his parents' home. His mother re-mortgaged the house to help with the business, which he went on to turn into a multi-million euro enterprise. Now his combined business sense and environmental experience means, if the rumours are true, I could be looking at our new Minister for the Environment. He is coy, but he tells me there were meetings the night before with Fianna Fail and now he has another coffee meeting to run to with Taoiseach Enda Kenny. "Can we do a quick test on your carbon footprint before you go?" I ask. Thanks to his travel to climate change conferences, his global footprint rings in at 13.5 tonnes. The ideal is 2-3 tonnes per person. As Eamon is first to admit, it's something he has to work on. Maybe someone should introduce our climate change leaders to the wonderful world of Skype.